Two creatures of legend live side by side in Zambia. The first is a very old truck. It has been used in the construction of the homes of thousands of farmers and after 46 years’ service it is still operating despite the leaks and constant break-downs. 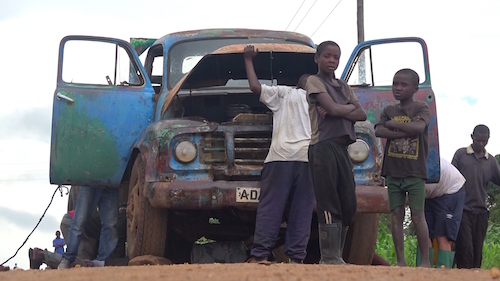 But, in the rainy season, the old vehicle struggles on the country’s tracks. For owners, Nicolas and his father, Cosam, keeping it moving is a matter of survival. But they are not alone: the whole village rallies round to help them. It’s a way of saying thank you for all the years of good and faithful service. The second creature of legend is a powerful person. When the waters of the Zambezi flood the plains, the signal is given to King Iosis Imwiko II to quit his palace and take up residence somewhere drier. This is the start of an incredible procession where the king removes with his court. It takes 8 hours. 150 boats and 600 paddlers take part in this “removal”. The image is staggering: the royal canoe, decorated with a giant elephant, heads the fleet to the beat of drums and the chants of the paddlers. Once the king has left, and only then, the farmers who live on the flooded land are then allowed to leave. Be supportive, sacrifice yourself to help others, adapt to obstacles: the inhabitants of Zambia, one of the poorest countries in the world, learn from infancy what is needed to avoid dying of starvation, like going to dig in the lead mines. The mineral dust wreaks havoc. To protect themselves, workers use a pathetic protection: they drink milk every morning !